At virtually the same time NASA's Goddard Institute for Space Studies was correcting historical climate data with the assistance of Climate Audit's Steve McIntyre, a British mathematician discovered serious flaws in papers used and cited by the United Nations' Intergovernmental Panel on Climate Change in its most recent Assessment Report. Douglas J. Keenan, a former Morgan Stanley arbitrageur and current independent mathematical researcher, identified "fabrications" in such studies that suggest a "marked lack of integrity in some important work on global warming that is relied upon by the IPCC" and that "the insignificance of urbanization effects on temperature measurements has not been established as reliably as the IPCC assessment report assumes." 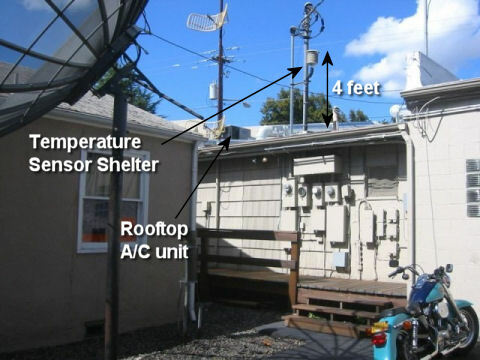 Meteorological stations sometimes move, and this can affect the temperature measurements of the stations. For example, one of the stations relied upon by the above two papers was originally located on the upwind side of a city and later moved, 25 km, to be on the downwind side of the city. Such a move would be expected to increase the measured temperatures, because a city generates heat. Another station relied upon by the papers was originally located in the center of a city and then moved, 15 km, to be by the shore of a sea. Such a move would be expected to decrease the measured temperatures. In global warming studies, an important issue concerns the integrity of temperature measurements from meteorological stations. The latest assessment report from the IPCC indicates that the global average temperature rose by roughly 0.3 °C over the period 1954-1983. Thus, if errors in temperature measurements were of similar size to, or larger than, 0.3 °C, there could be a serious problem for global warming studies. The papers of Jones et al. and Wang et al. both consider this issue. The paper of Jones et al. is one of the main 2 works cited by the IPCC to support its contention that measurement errors arising from urbanization are tiny, and therefore are not a serious problem. Regarding station movements over time, the papers of Jones et al. and Wang et al. make the following statements. Each paper gives the same reference for its statement: a report resulting from a project done jointly by the U.S. Department of Energy (DOE) and the Chinese Academy of Sciences (CAS). The DOE/CAS report (available via http://cdiac.esd.ornl.gov/ndps/ndp039.html) resulted from concern over "possible CO2-induced climate changes". Its purpose was to present "the most comprehensive, long-term instrumental Chinese climate data presently available". It contains, in particular, histories of some Chinese meteorological stations, including the different locations of those stations and the dates on which they moved, if any. The DOE/CAS report was formally published in full in 1991-Wang et al. and Jones et al. used a pre-publication version of the report. A revised version of the report was published in 1997, but the station histories are the same in the two versions. Jones et al. and Wang et al. consider the same 84 meteorological stations in China. Regarding 49 of those stations, the DOE/CAS report says, "station histories are not currently available" and "details regarding instrumentation, collection methods, changes in station location or observing times ... are not known" (sect. 5). For those 49 stations, then, the above-quoted statements from the two papers are impossible. Regarding the remaining 35 stations that were analyzed by the two papers, I have prepared a summary of the relevant information from the DOE/CAS report. The summary is available at http://www.informath.org/apprise/a5620/b17.htm. As an example from the summary, one station had five different locations during 1954-1983, with the locations as much as 41 km apart. Two other stations each had four different locations. At least half the stations had substantial moves (two other examples, of 25 km and 15 km, were given above). Moreover, several stations have histories that are inconsistent, making reliable analysis unattainable. Additionally, the following statement from the DOE/CAS report seems apposite: "Few station records included in the PRC data sets can be considered truly homogeneous [i.e. have no significant changes in location, instrumentation, etc.]. Even the best stations were subject to minor relocations or changes in observing times, and many have undoubtedly experienced large increases in urbanization." The essential point here is that the quoted statements from Jones et al. and Wang et al. cannot be true and could not be in error by accident. The statements are fabricated. Readers are encouraged to review Keenan's entire report, as well as the summary available at his website Informath.org, to make their own conclusions. However, as errors in data collection and dissemination - be they innocent or intentional - continue to surface in reports crucial to the opinion of the IPCC and global warming alarmists around the world, it seems reasonable to conclude that not only isn't the debate over as folks like soon-to-be-Dr. Al Gore continually avow, it has only just begun.